ST. JOHN'S, N.L. -- The largest-ever oil spill off the coast of Newfoundland has raised fresh safety and environmental concerns about how the province's expanding offshore oil industry is regulated. An estimated 250 cubic metres of oil leaked into the sea southeast of St. John's from the SeaRose oil platform on Friday. That translates to about 250,000 litres, compared to the 165,000 litres that leaked from the Terra Nova platform in 2004. At the time, that spill was the largest for Canada's East Coast offshore industry. Rough seas hindered workers from reaching the spill over the weekend, so the exact cause and scale of the leak have yet to be determined. A statement from the Canada-Newfoundland and Labrador Offshore Petroleum Board said the incident speaks to the considerable risks in offshore oil production. "The risks in offshore oil activity can never be underestimated, especially in our harsh environment. Those risks are only acceptable when all reasonable measures have been taken to reduce them," the statement read. All offshore oil rigs in the province's waters were temporarily shut down while the environmental conditions were being assessed, but the offshore board said Monday afternoon the Hebron platform had restarted following safety checks. Natural Resources Minister Siobhan Coady said a subsea remote-operated vehicle was to be dispatched Monday to look at the flowline to confirm quantity and more closely investigate the cause. "They did have surveillance flights going out and looking at the extent of the spill, but very little could be done with the containment," Coady said. "We're going to continue to monitor to find what the impacts are." The spill occurred on Friday morning while the province was caught in the throes of the most intense storm in the world at the time, according to Environment Canada. 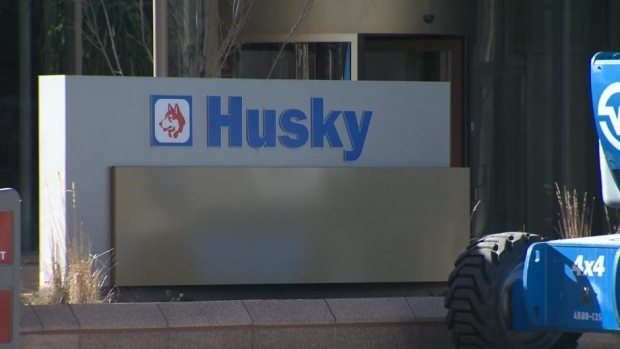 Colleen McConnell of Husky Energy said the spill happened as warm oil from the rig was being circulated to prepare flowlines for restarting production. Four oiled seabirds had been observed as of Monday afternoon, the offshore board said on Twitter, "one of which may be retrieved for cleaning." The board added that six vessels are now assessing wildlife impacts, with some independent observers on board. Surveillance flights and support vessels have been deployed to the area, with the current focus on wildlife sightings. The spill is currently believed to be a "batch spill" and not a continuous leak. The incident has raised questions about the industry's emergency response preparations, and it comes hot on the heels of a recent close call with the SeaRose platform. In March 2017, the floating platform was not disconnected during a near-miss with a large iceberg, with 84 people and upwards of 340,000 barrels of crude oil onboard at the time. An investigation into the incident, released this summer, found that Husky Energy's management failed to follow and enforce its ice management plan. Earlier this year, the province announced a goal to double overall oil production to more than 650,000 barrels a day by 2030. This includes a target of 100 new exploration wells. Also announced this year was the first project in the Flemish Pass basin, and its first foray into deepwater oil production. It's nearly 10 times deeper than SeaRose, the current deepest offshore oil site. Premier Dwight Ball called the development of the Bay du Nord site a "new frontier" for the province's oil and gas industry. During question period in the provincial House of Assembly, NDP Leader Gerry Rogers asked if Ball would create an independent offshore oil authority that would ensure oil companies prioritize environmental and worker safety over profit. Coady said the province will closely monitor the offshore board's investigation. "Yes, we want more activity offshore Newfoundland and Labrador, but as I said at the very beginning -- safety and environmental protection is the priority, not development and growth," Coady said. "We will be informed by what this investigation finds. Right now we're concerned with the spill."